I have tended to shy away from national politics and issues in this blog, keeping it more focused on local and council issues. However, one subject that increasingly concerns me is the erosion of civil liberties in this country. Yesterday saw another little chunk of our freedoms eroded with section 76 of the Counter Terrorism Act coming into force. Photographers must now be a careful they don’t get the police in their photos for fear of arrest. I have an interest in this because I have already (late last year, before s76 was in force) been stopped by the police for taking a photo. 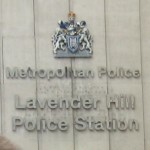 I was on Lavender Hill and my sin was to get a police car in a photo taken near Lavender Hill police station. Four officers questioned me because, apparently, my behaviour was suspicious – something I refused to acknowledge (though I would later admit it was a truly awful photo, bad framing and a bit of camera shake). I suppose you could argue that Al-Qaeda don’t realise those white cars with orange stripes are the police. I think it a bit unlikely. This is already a remarkably common occurence. Within days of being stopped myself, I heard, through friends, of two other people who had been stopped and searched under section 44 of the Terrorism Act for taking photos at Clapham Junction. It seems that even before section 76 you had to be worried if you were innocently taking a photo. Now you can argue that, of course, they aren’t going to be stopping the innocent tourist or hobbyist photographer. So what’s the point of the power? I’m guessing the average terrorist tries to blend in rather than look like a terrrorist, which implies the police are either going to have to question lots of innocent people in the hope of catching a terrorist, or they are going to have to rely on other intelligence. If the latter is the case, then why do they need powers like those given under the Terrorism Act 2000 and the Counter Terrorism Act 2008? Many years ago I would have said that a police state could never happen in this country. Nowadays, it seems the Blair and Brown governments don’t just want to show that it could, they are actually working to make it a reality. Not always true. The police can be a little over enthusiastic about using stop and search powers… and sometimes it is unlawful. I can only go by my experience of the police, which has usually been positive. While I wouldn’t count the example I have cited as a highlight, I have to say that I have found the Wandsworth police impressive in their professionalism, courtesy and dedication. I am sure there are extreme examples either way – you will get outliers in any large organisation – but the real problem is not those individual officers but a central government that is whipping up fear to justify laws that, if we’re honest, probably do more more harm than good. The police use whatever law fits the bill to achieve there agenda. The intent with which the law was passed doesn’t enter into it. 80+ year old members of the labour party roughed up and ejected for heckling and then questioned using, that’s right you guessed it, Anti-Terror legislation. If Al-Qaeda can recruit 80 year old English men I think we are already in trouble. What is the Conservative party’s stance on all of these laws? I find it unlikely that they will remove them from the books if they make it to power, they are too useful to have around. I would hope that, when in power, we would get rid of them. We opposed 42-day detention, oppose ID cards and, of course, David Davis is a fantastic champion for civil liberties in the party. I believe we have plenty of people in the party who are passionate believers in civil liberties. My real fear is not that it will be cynically kept on the statute book because it’s useful, but that the economy will be in such a mess that will take the priority when it comes to Parliamentary time. Re-reading this I’m surprised that I missed another key detail. Part of my ‘suspicious’ behaviour was to write in a note book! Obviously it didn’t fit into the section 76 issue, but on reflection the idea that section 44 of the 2000 acts allows the highly suspicious behaviour of being literate in incredibly worrying. Presumably the next step is to arrest dangerous spectacle-wearing intellectuals. The thing is with section 44 is that they don’t need to have any suspicion of wrong-doing to stop and search you. I was stopped in Clapham Junction ealier this month while minding my own business listening to my iPod. I wasn’t searched, the officers just wrote down my details and gave me a slip of paper. What I didn’t realise is that data is now on record for seven years and can be used in any investigation (not limited to terrorism) by police or other government bodies. I was told this in an email from Stewart Low, the Borough Commander of Wandsworth police, whom I emailed to complain. The fact that I wasn’t even searched led me to believe that this was just a data gathering exercise and a way to build up stat for the borough to prove how well they are fighting terrorism – a clear abuse of the powers. People should be informed that if you are stopped under section 44 the police are entitled to stop and search you. That is all. You DO NOT have to give any personal details or account for your behavior. I wish I knew this at the time. PS. Google the term ‘useless bureaucrat’ and hit I’m feeling lucky. Childish I know but it make me feel better. The current climate worries me enormously. The current set of Met adverts, for example, seem more likely to create paranoia and mistrust within and between communities than do anything to tackle terrorism. S44 stops are not intelligence led and as far as they know have never led to an arrest for anything terrorist related. S76 is a blatant attack on basic freedoms. Your story is just, I’m afraid, another statistic. I should, however, defend Ch. Supt. Low who is a superb officer and has done an enormous amount to reduce crime in the borough. The problem is higher up and primarily with the government. I know that many police officers disagree with S44, but have no choice but follow targets for ‘random’ searches. I know I’m just one of hundreds of thousands stopped in this manner and I’m only singling out Wandsworth as that’s the borough in which I was stopped. It could have happened anywhere in London or on the British transport network. The borough commanders need to take some responsibility; it’s too easy to blame ‘higher ups’ for forcing bureaucracy on civil service management. According to Stewart Low in the email sent to me there are no targets for wandsworth borough police regarding section 44 stops. Yet according to the officers who stopped me they are expected to use the section 44 powers whenever possible. So where are the instructions coming from? Also, regarding the point about terrorism related arrests. I directly asked Mr Low how many arrests there had been in his borough as a result of section 44 stops and he declined to answer. I then asked him if the number was more than zero. He declined to answer. I’m sure Mr Low was being somewhat diplomatic (putting it nicely) with his answers to me due to the controversial nature of the laws. I’m aware that at his level, there is a greater need for the policemen to be a politician than the PC who stopped me. I don’t pretend to be familiar with Stewart Low and his work and I’m sure, as you say, he has done a lot of good. I have to say I was impressed that he took the time to respond to my direct email. I suppose this is why I chose to attack the policy at his level. I doubt I would have got a response from Gordon Brown! If everyone who is stopped under these laws took the time to write to the borough commander of the police force they were stopped by, politely stating their legitimate concerns and asking a few awkward questions, the chief supers might start to wonder if their statistics are worth all the aggro. I’m sure the instructions to the street coppers would change and the stops laws might start to be used more appropriately. One can only wonder what would happen if more people started complaining. In the UK many, even now, are raised to respect the police and have an unquestioning acceptance that whatever they do is ‘right’. I was raised in exactly the same way and have gradually found myself drifting away from that analysis, and realising that while we have some incredibly good and dedicated police officers part of their job involves upholding, enforcing or implementing laws made by a government dominated legislature. I think where we differ is where the problem lies. I would put it firmly at the government’s door. I would be very uneasy if the police were to either ignore or disrupt the will of an elected government. But at the end of it all, wherever the problem or the solution lies, the consequences for individuals who fall foul or section 44 or section 76 remain the same. The government can grant the police powers and offer guidelines on their use, but ultimately it’s the police force who operate these procedures. With a power as seemingly vague and wide-reaching as the new anti terror laws the implementation is surely down to the police force? I agree that something needs to be done on a government level but the police force could address much of the problem by moderating how they use these powers.